Hey, if anyone is near St. Maries, Idaho, I'll be doing a booksigning for The Simplicity Primer tomorrow (Saturday) from 1-3 pm, sponsored by The Paper House (822 Main Street). 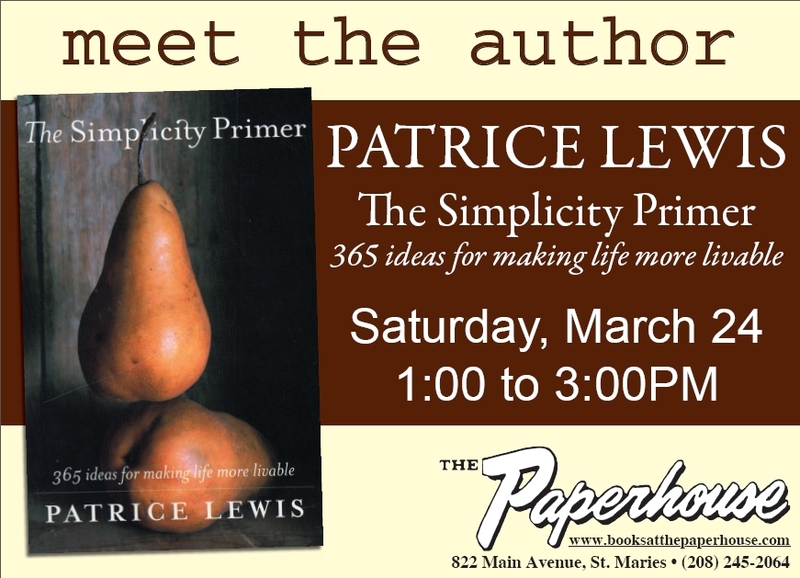 I realize this is (cough) a little out of the way for most folks, but I'd love to meet any local readers. Hope to see some of you there! Wish I was close by. The wife and I have been looking in the St Maries area for property. Is a bit difficult when we still live in the Washington DC area. But somewhere between there and Coeur d'Alene is where we would love to finally land. Girl, I'm so proud of you. When you get out here to sign books on the western peninsula I've got your room ready, and I'll do all the cooking! I finally downloaded your book this week on my Nook. I am at a loss for words on how wonderful it is!!!!!! Thank you, thank you, thank you for writing such a practical, inspiring, book. If you are ever in our area our door is open for you to kick up your feet and rest for awhile. Your book will will bless so many families for generations to come. Aww, thanks Debby. You're very kind.